VICTORY! 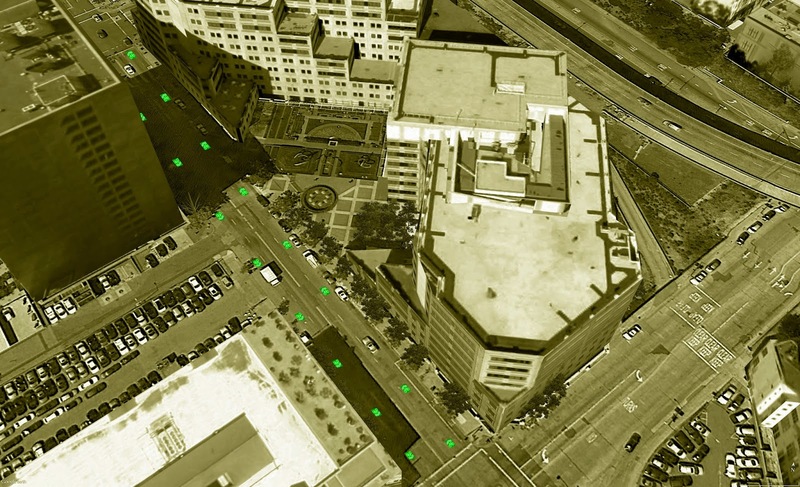 The EIR was certified at the SF Planning Commission, and the SFMTA Board approved the design. On to construction in 2016! 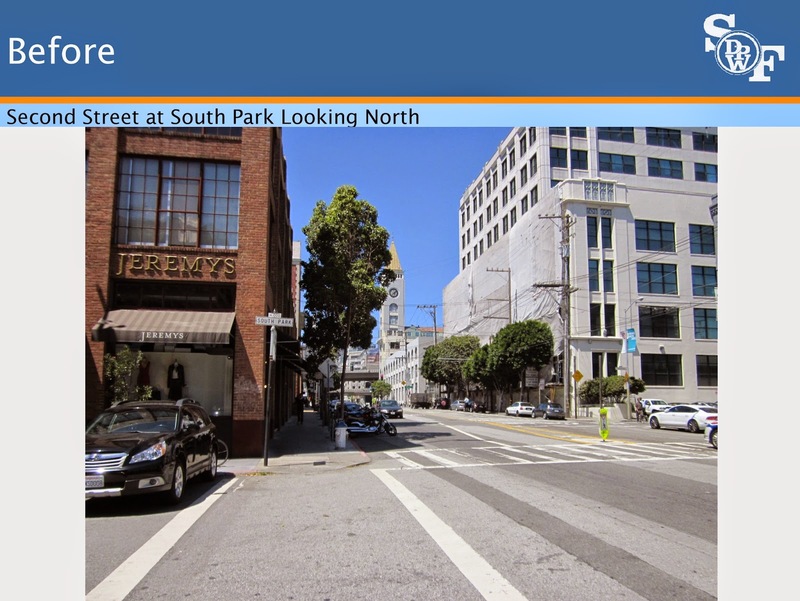 Great Second Street Goes to the SF Planning Commission Thursday afternoon August 13th 2015 for certification of the Enviromental Impact Report, and then the week after, August 18th, to the SFMTA Board for approval of the parking and traffic changes. For the past four years, San Francisco Municipal Transportation Agency, Public Works, and the Planning Department have been working closely with the SoMa community and Walk SF members to develop plans to address both pedestrian safety and walkability needs. Now, an ideal plan is being proposed for your review and approval. 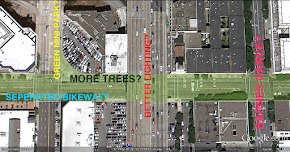 As more people live, work, and play in SoMa, the City must build safer, more efficient and more sustainable streets. 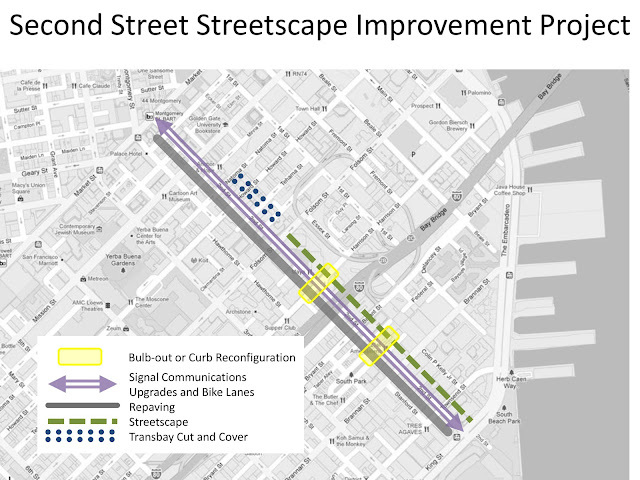 The Second Street Improvement Project does all of this and demonstrates how even SoMa's traffic-choked roads can be re-designed to support San Francisco's Vision Zero goal to end all traffic deaths and serious injuries by 2024. The Second Street Improvement Project includes widened sidewalks, pedestrian-friendly lighting, safer crossings (including left-turn restrictions and the elimination of the right turn lanes at Harrison and Second), enhanced landscaping, ADA-compliant curb ramps, and a cycle track for people biking. It will create a more attractive public realm and enhance the economic vitality of the corridor by attracting foot traffic, as well as minimize transit delays, and create a separated bicycle lane to increase safety for everyone who travels here. The City's project scope diagram. 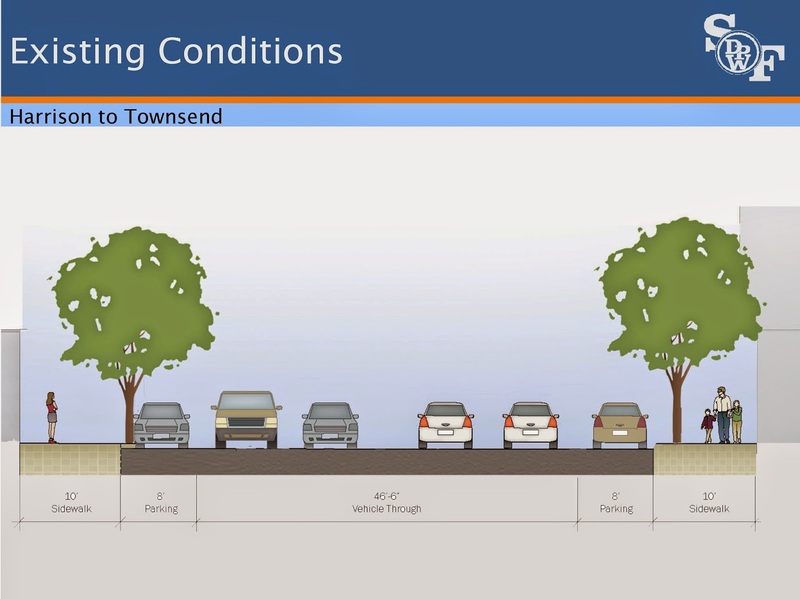 The "Streetscape" element includes widening the sidewalks from 10 to 15 ft.
Carmageddon Comes to Second Street! It's getting crazier out there as drivers try to make their way onto the Bay Bridge during weekday rush hours from 3 to 6pm. There is no doubt that this is a very challenging traffic situation, often approaching "gridlock." While alleviating the gridlock will involve a comprehensive program of enhanced transit and (dis)incentives, keeping crosswalks clear is essential for sustaining a basic quality of life in the neighborhood. The Barnes Dance crossing offers an ideal solution. By stopping all traffic to allow walkers to cross in all six directions at once, this approach offers the greatest level of pedestrian safety while ends the vicious (and frankly pointless) cycle of drivers blocking the intersection to keep other cars from blocking them. Making streets safer for people while reducing the anxiety of those in cars: Everybody wins. 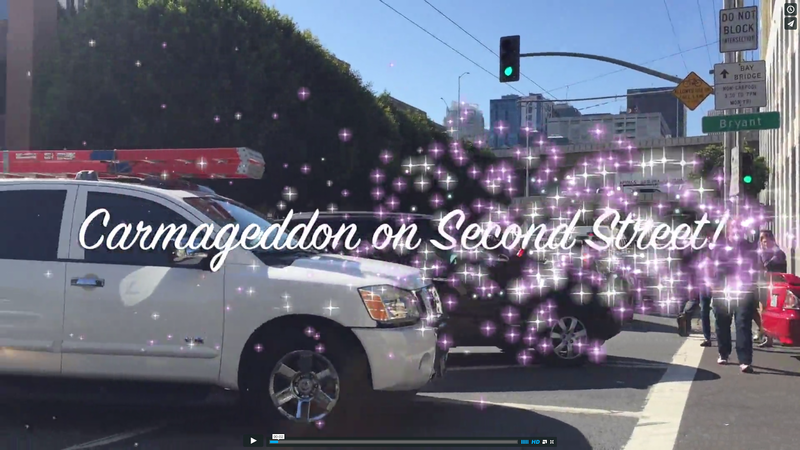 Watch the movie Carmageddon on Second Street on Vimeo. AFTER: Second Street at South Park. 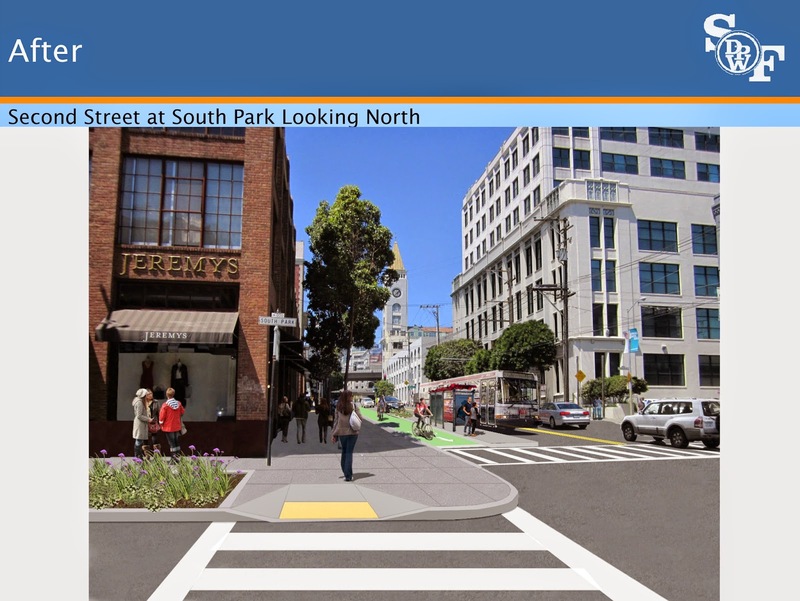 The SF Department of Public works produced these before and after digital visualizations of Second Street's preferred design which is currently making it's way through the CEQUA process. The design features raised and protected cycle tracks, similar to the type used widely in Copenhagen. 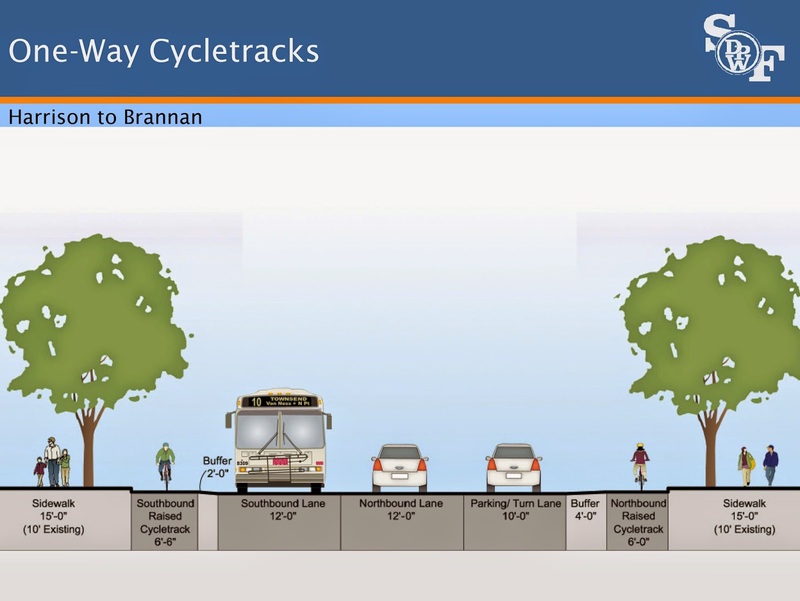 This sort of first rate cycling improvement is justified because Second Street is a critical part of the City's cycle route network, connecting downtown to the Giant's Stadium, Central Waterfront, and Blue Green Way. Besides raising property values this will be much safer for pedestrians and cyclists. It's been in process for over 10 years, and is scheduled to be completed in 2016. Before: Second Street at South Park looking north. In the early years of this millennium the San Francisco MTA invented a new type of bike symbol: The sharrow. It sounds simple, but it was a major task to do the research and experiments to see if these things actually did any good and then to take the documentation to the U.S. Traffic Symbol Gods. Eventually sharrows were officially blessed, and many have been painted to designate bicycle routes that can't—or don't yet—have dedicated bike lanes or cycle tracks. Second Street was actually a pilot route in this early research, which can be seen in the few faded sharrows still visible on some blocks. A wild super sharrow in San Francisco. More recently in collaboration with the national Green Lane Project (www.peopleforbikes.org/green-lane-project), the next generation was rolled out. 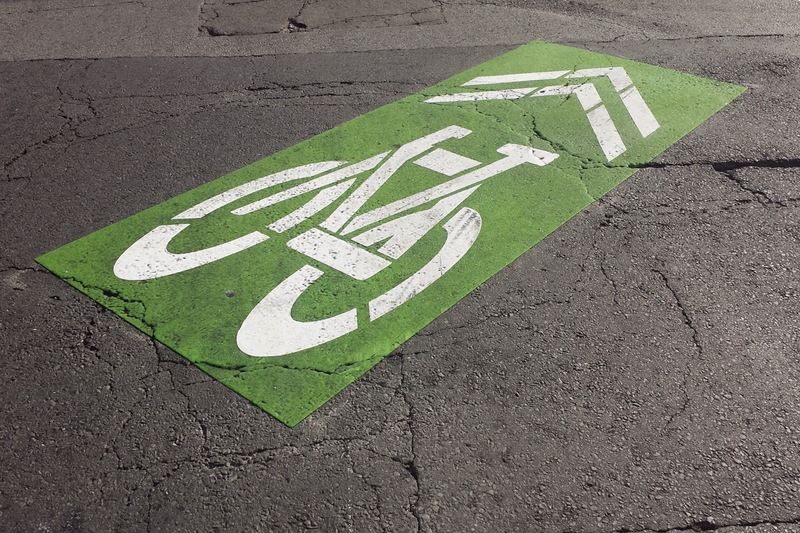 Introducing the super sharrow, which adds a beautiful rectangle of reflective safety green paint underneath the iconic symbol. These are highly visible and quite effective in getting motorists to be more mindful of bicycles.The SFMTA recently added super sharrows down the length of Market Street at about 60-foot intervals. They help by reminding motorists to respect the vulnerable road user and that—most importantly—bikes belong. An aerial view of what super sharrows would look like on Second Street if installed the same way as they currently appear on Market Street in downtown San Francisco. At the urging of Supervisor Jane Kim, the SFMTA has committed to adding super sharrows to Second Street as an interim step toward final safety improvements. The installation date has yet to be determined. Another view of Second Street with a super sharrow layout similar to those recently added to Market Street. More Bikes on Second Street! 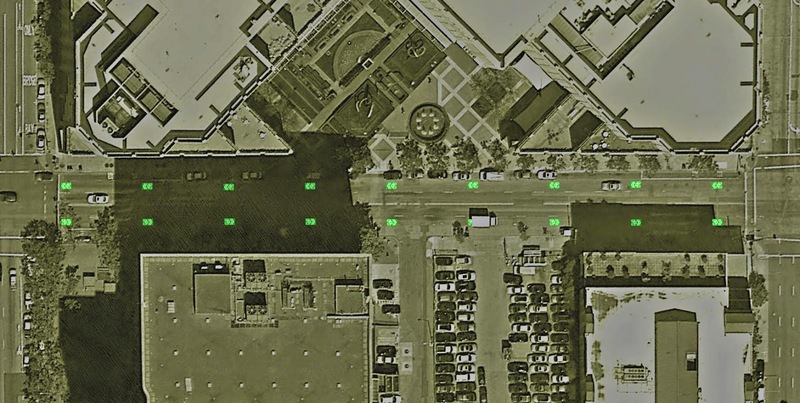 Does it seem like you see more urban cyclists on Second Street? 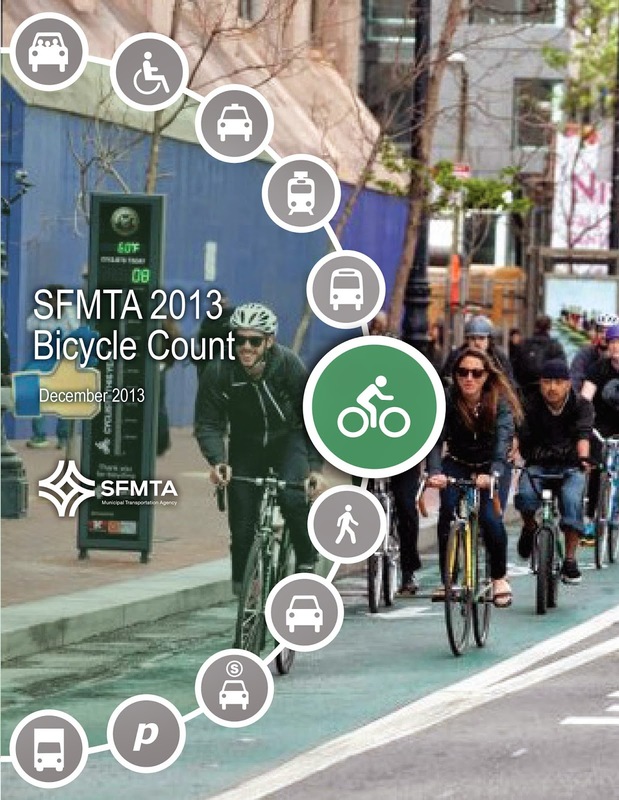 The 2013 SFMTA Bike Count confirms this: from 2011 to 2013 there has been a 35% increase in cycling on Second, one of the largest jumps of any corridor in San Francisco. This is not anecdotal: these counts are just that, real time data. And this is with zero physical improvement to the bicycle infrastructure on the major bicycle route. 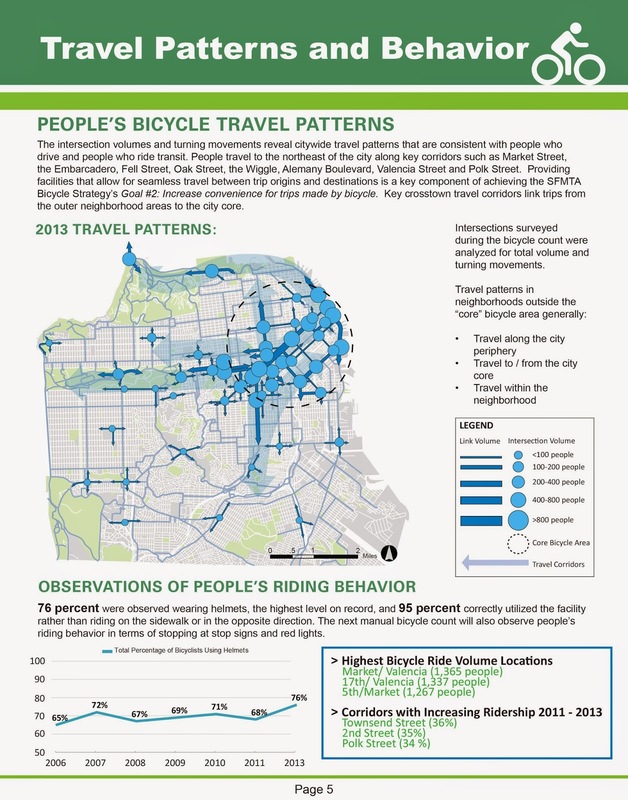 2nd Street bicycle count up 35% in two years! 2nd Street Supporters Meet Up! Hello again! It has been about 6 months since we last met at the 4th 2nd Street community meeting in May. Thank you to everyone who came out and voiced the importance for a safer 2nd Street, supported the proposed design (full design), and most importantly represented what is the BIGGER picture: a corridor that pedestrians, cyclists, transit and automobiles can utilize happily and together. Despite the huge amount of work we have all put into this project over many years, this exciting new vision for 2nd Street is still far from assured. It's crucial that we keep the pressure on the City to vote for the better design option - Sharrows are not enough for 2nd Street. Please join us, the San Francisco Bicycle Coalition, and your fellow 2nd Street supporters for an after work meet up. Let's share a drink (non-alcoholic available) and chat about how to ensure that the City votes for the best design to ultimately make 2nd Street GREAT. sidewalks are widened everywhere to 15 feet. more and better street trees. Come to this meeting and support this great pedestrian friendly design and help make sure it happens! 2nd Street is scheduled to repaved soon. We think a smooth street is wonderful, there are other things to fix besides potholes. Crossing the wide street can be dangerous, green is sparse, and there are no bike lanes. Join us in making 2nd Street GREAT! What would make Second Street a great place for people?